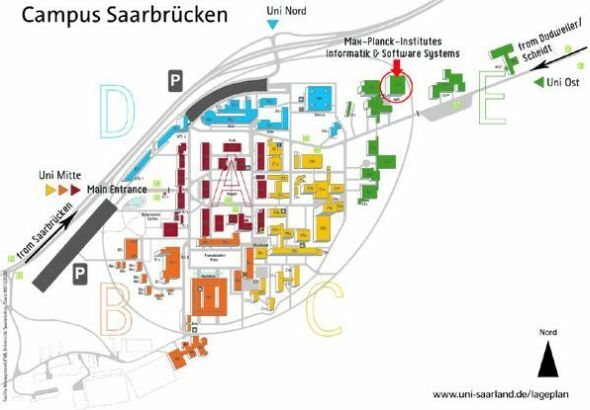 The VMV 2007 will be hosted by the Max-Planck-Institut Informatik that is located at the university campus of Saarbücken. If you should travel here by bus: leave the bus at the stop "Universität Campus" and walk to building E 1.4. If you travel by car: use the gate "Universität Ost". Free parking lots will be provided at the conference venue. Please consult the map below for directions. The campus is divided into sections A to E.
You can find bus stops in section A (Universität Campus), D (Universität Mensa) and E (Universität Busterminal). To reach the MPI, get out at either of those bus stops and walk to building E 1.4. Printable version of the map in PDF-Format.